This article is about farmers in the original version of the game. 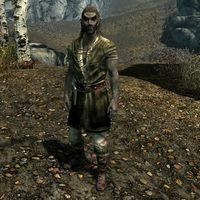 For the werewolf farmer added by the Dawnguard add-on, see Farmer (Werewolf). This Farmer is a Dunmer named Bodryn who is looking to join the Imperials. He wields an iron war axe and dagger and wears standard farm clothes. 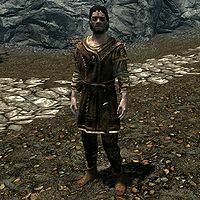 When you meet him, he will inform you: "I'm on my way to Solitude to join the Legion. A united Empire is better for everyone." After that, he will only say: "I was born and raised in Skyrim, but the Nords treat us like dirt." This Farmer is an Imperial named Sylvian who is looking to join the Stormcloaks. He wields an iron sword and dagger and wears standard farm clothes. 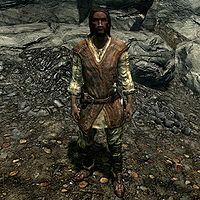 If you meet him he will say: "I'm on my way to Windhelm to join up with the Stormcloaks. Ulfric has the right of it." After that, he will add: "The Empire is in shambles. 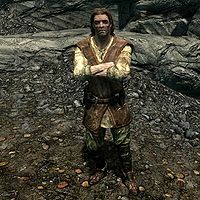 They've banned the worship of Talos." This Farmer is a Nord bandit seeking refuge with his wife after a dragon attack. He wields an iron dagger and wears standard farm clothes. He also carries a raw piece of fruit or vegetable. When you get near him, he will immediately warn you: "There are dragons about, traveler. Be warned." 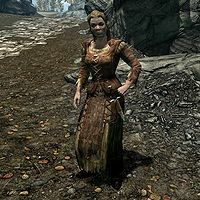 When you concur and tell him you were at Helgen, he will respond: "Then you've seen them, too. We lost our home, our livestock... We barely have enough gold to get by." You can then choose to help them out by donating 5 gold. If you give him the gold he will gratefully say: "Thank you, traveler. Be safe and don't forget to keep an eye on the sky." However, if you decide not to give him the gold, he will say: "That's okay. We'll find a way to get by. Safe travels. ", a line he shares with his wife. If you gave him the gold he will now greet you with: "Thank you for the gold, traveler." She wields an iron dagger and wears standard farm clothes. She also carries a raw piece of fruit or vegetable. When you approach her, she will start to tell her story: "It happened so fast. One minute the dragon was there, the next it was gone. Everything was destroyed." If you ask her if she saw where the dragon went, she will say: "No. I was too afraid to look. I don't know what we're going to do now. We have nothing left." If you choose to help her by donating 5 gold, she will express her gratitude with: "You're too kind. Thank you. Be careful and stay safe." Should you choose not to help them with the finances, she will respond in the same way as her husband: "That's okay. We'll find a way to get by. Safe travels." If you gave her the gold she will now greet you with: "Thank you for your kindness." This Farmer is a Nord bandit who is leading his painted cow to a giant camp to keep the giants away. When you approach him and his cow, he will warn you: "I'd stay away if I were you." He will then explain why: "I'm on my way to a giant camp and I can't guarantee those beasts won't think you're part of the offering. Keep your distance and you shouldn't have anything to worry about." You can now choose between three options. Wishing him 'good luck' will just make him say: "Thanks. You take care of yourself, now." If you ask him if he needs any help, he will respond: "I have everything under control. Thanks for offering." If you ask him what kind of offering he is bringing, he will reveal himself to be quite superstitious: "The cow, of course. Others do it differently, but I've found that an annual offering usually keeps the giants away from our livestock. Some think it's superstition, but I believe it works. I've yet to have a giant kill any of my livestock." He will then explain the paint on the cow: "It's tradition. We mark the animal as a way to let the giants know we're giving it to them willingly. Sort of a peace offering." He will then continue walking, saying: "Either way this ends up, I'm headed to the inn." Should the cow happen to die, the Farmer will be in despair: "My wife's going to kill me when I tell her we'll need to bring another cow." Sometimes the giants kill him after he leaves his offering. This page was last modified on 5 September 2014, at 04:17.